Is it possible to turn off a preference in iTunes or elsewhere to disallow auto-play when streaming audio from the Web? And I clicked my tongue in that annoyingly impatient way I do when I’m over-caffeinated and thought “Well, duh, there’s an option to turn it on in iTunes’ Advanced preference. How tough could it be to turn it off?” But before issuing a duh-less response (cuz doing otherwise invites a spicy retort) I double-checked this self-same preference. And, sure enough, halfway down the pane there was the Use iTunes for Internet Playback option next to a Set button. Guess I haven’t set it. Okay, just give that little sucker a click, it will change to something like Un-Set, and…. Clicking the button only produced a dialog box that read “iTunes has been set as the default application for Internet music playback.” The Set button didn’t change a vowel or consonant. Ah, wait, there’s a Reset All Dialog Warnings option with a Reset button next to it. Maybe clicking that will do something. So I clicked Reset, closed the Preferences window, quit iTunes, opened my web browser, clicked on a link that would normally cause iTunes to stream, and… iTunes opened and started streaming. After searching iTunes from top to bottom it became clear that Apple left the option to undo this command in its other pair of pants. The problem is that when you click this Set button or accept iTunes’ offer to stream Internet content when you first install the application, iTunes changes the file associates so that it rules .m3u files (Internet audio streams). If you prefer that it not, you have to change that association. And how to do that? Our friend Google came to the rescue in the form of a link to an old Mac OS X Hints forum post. Here, forum members posted links to a couple of tools for configuring file associations. One Trevor suggested Alexander Clauss’ free MisFox and a Mr., Ms., or Mrs. Hayne offered a link to Rubicode’s equally free RCDefaultApp (a preference pane, which, in 2004, made our own Dan Frakes swoon). I installed and fired-up RCDefault, chose the Extensions tab, located the m3u entry, and discovered that it was associated with iTunes. Clicking on the Default Application pop-up menu I was able to choose a different application or completely disable the association, so that nothing would play these files. 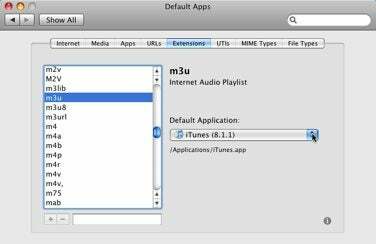 If m3u files aren’t your problem—other audio files automatically open in iTunes and you don’t want them to—you’re welcome to locate an example file, click on it, press Command-I, choose the application you would like to open such files with the Open With pop-up menu that appears in the Info window, and then click Change All.